Fifth grade is a time for transition. Students build upon the skills and content developed and learned in the Lower School, while establishing their own identities as members of the Upper School community. Fifth grade at Cathedral lays the foundation for continued growth and ensures that even the youngest members of our Upper School know that their voices matter. The fifth grade investigates the following mathematical concepts: applying operations to fractions, decimals, and percentages; ratio, proportion, and scale; and integers and pre-algebraic equations (one-step and inverse operations). Students also investigate area and perimeter. The curriculum uses hands-on activities, games, problem solving, independent and group projects, and class homework review as teaching tools. In fifth grade, students continue to build on the work they have done in the Lower School to hone their writing skills, focusing on writing clear paragraphs and cogent essays, with a comprehensive editing and rewriting effort. This writing includes traditional essay composition, as well as letters, fiction, and poetry. 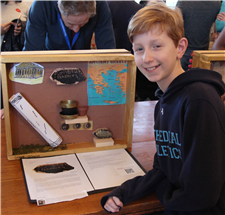 Students analyze fiction by reading and discussing novels as a class and connecting what they read with the social studies curriculum through an investigation of ancient artifacts. Concentrated study of English grammar is also a focus of the fifth grade English curriculum, as students continue to develop punctuation and sentence structure skills. Finally, the students develop their vocabulary using words from shared reading. Students develop and apply scientific inquiry, measurement skills, and the scientific method to experimentation. They also develop and use age-appropriate design-thinking skills through problem solving and STEAM-oriented activities. The fifth grade curriculum includes The Study of Matter: phases, atomic and molecular structures, chemical reactions, introduction to chemistry; Characteristics of Life: kingdoms and classifications; Anthropod Study: grasshopper dissection and independent anthropod research; and Life Science topics: viruses, bacteria, protozoa, fungi, plants, and ecology. In the Upper School Science Lab, students learn the fundamentals of lab work, including maintaining a lab notebook and proper scientific report writing. The fifth grade social studies curriculum explores the concept of geography as destiny. Students read and create maps, developing imaginary cultures using the vocabulary and principles of geography. In doing so, the students examine how their own experiences shape our understanding of other cultures, traditions, and beliefs. In the fifth grade, students continue their study of French or Spanish. They use listening activities, pronunciation practice, and beginning reading and writing to increase their proficiency. French or Spanish instruction includes basic grammar study: articles, adjectives, adverbs, prepositions, regular and irregular verb conjugation in present tense, and forming simple sentences. Vocabulary continues to be built by exploring French- or Spanish-speaking cultures and by encouraging beginning conversational skills. An essential question of fifth grade social studies is, “How do objects define us?” In the multifaceted Artifact Project, students look at objects that define them in their own lives before expanding that concept to objects that have defined cultures throughout history, either from necessity or cultural expression. In English, books like The Red Pencil by Andrea Davis and Shooting Kabul by N. H. Senzai allow fifth graders to discover the way characters relate to objects as symbols of greater goals and aspirations. In social studies, students are assigned a significant object from history–for example, movable type–and research why it was important and why that importance has endured. As they come to the end of their research, students construct Joseph Cornell-style shadow boxes to place the object and other related materials in their proper context.